I love having fresh flowers in our home. I wish I could always have a beautiful arrangement in the center of the table and one for the sofa table as well but they are just to expensive. This time of the year it is especially nice to have a special arrangement for those family dinners. This year, with about $13.00 dollars worth of grocery store cut flowers I was able to make just what I was hoping for on a major budget. When I was in high school and college I was lucky enough work at two different flower shops. I went from cutting flowers and cleaning up to arranging and planning wedding flowers over the years. I loved every second of working in those shops, and gained some great experience that I use often at home. 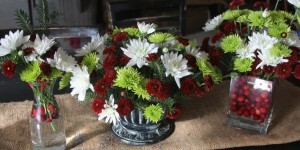 I learned how to cut and care for flowers, and how to quickly and easily arrange them in vases, pots, baskets, and more. I love to give flowers as gifts, but they are very pricey when purchased at a floral shop, and with good reason…but you can create your own arrangements at home with flowers that you pick up at your local grocery store. I often do this with roses around valentines day for the kids to give their grandparents, or special birthdays, and holidays. For far less money I can give flowers that are just as beautiful as the ones you see in the flower shops. While shopping at my local grocery store last week I noticed that they had a great price on mums. They were three packages (containing 7 stems of flowers each) for only $13.00. 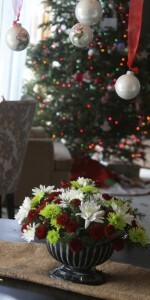 They were many choices of beautifully Christmas colored and healthy looking flowers. I love to choose mums because they are nice and full. They cover a lot of space – thus you need fewer flowers to create a nice arrangement. They also allow you to arrange without using filler flowers like babies breath or yarrow for example. I brought home my 3 packages of flowers and was ready to get started on arrangement number one. 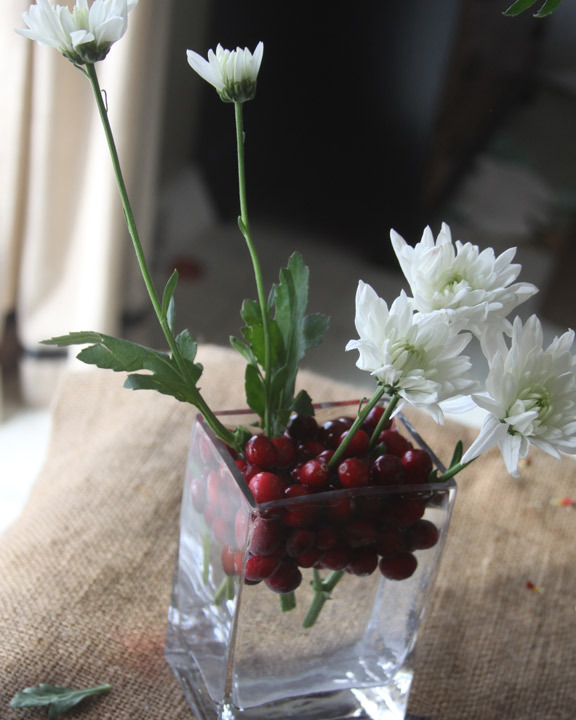 This is a smaller arrangement in a square glass vase that I had already to set on our sofa table. It needed to look good from both sides and be tall enough to see from over the couch but short enough to fit under the lamp. 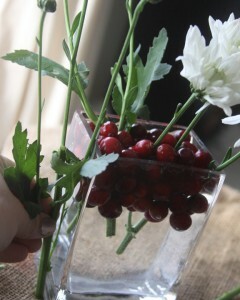 I Filled my square vase with water and left over fresh cranberries that I had left from a sangria recipe. The cranberries not only look beautiful and have a great Christmas red color, but they also help to hold the flowers in place as you are arranging them. If you haven’t ever arranged flowers in a vase before – this really makes it simple. I separated three stems of each colored flower from the bunches and saved the rest for my other arrangements. First cut your flowers from the stem on at an angle, it helps them last longer. When I am cutting stems of flowers that are bunched together like mums I always cut in a spot that gives me the most amount of flowers on the longest stem possible. You can see in the photo above where I am cutting. This gives volume and height to the arrangement. I usually separate the sections first and then cut the individual stems down that are still too long. When you are arranging fresh flowers in a vase set the stem down at the outside base of the vase and use that as your guide on where to cut the stem. Always cut a little at a time. You can always cut again, but you can’t make it longer after you have cut it. It seems obvious, but I have made that mistake many times. I then added one color of flower at a time and tied to evenly space them around the vase. Remember if you arrangement will be seen from all sides turn your vase while you are arranging to make sure it looks good in all directions. Your first few flowers that you add can determine the size and height that you want. I usually do my tallest and longest flowers first and then add the rest to fill in inside of those. Here is the finished arrangement done using 3 stems of each colored flower. 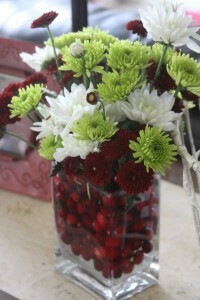 I also added in more cranberries at the end to fill in the vase with color. I do that over a folded towel, because some water will leak out of the vase. Remember to water this often because the cranberries take up more space than the water. Arrangement number two is a good sized table centerpiece that is wider and lower than the last. 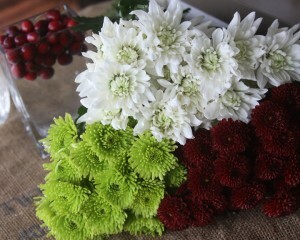 This arrangement also uses three stems of each color of flower, but you can use as many as you like. This is the perfect hostess gift if you need something to take to a holiday party or perfect for your family to enjoy in your own home. This arrangement started with a bowl that I usually keep fruit in on the table. You can use any kind of container that you have at home, a pretty bowl, a large mug, an old flower pot, anything that has the look you want will work. I also used one block of wet flower foam to make this. You can find it at any craft store, dollar store, or even Walmart. 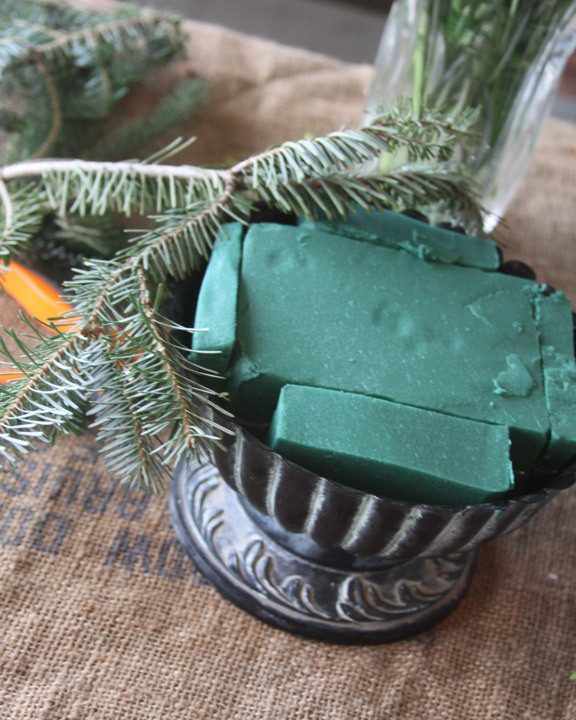 I soak the block in water in the sink for a little while and then cut and place it in my container. Try to make it as even and flush with the top of the container. Arranging in foam is super easy and a ton of fun. It requires fewer flowers than vases with cut flowers. I grabbed a couple evergreen branches from our pot outside to use as greenery for this centerpiece. It covers the foam nicely and gives the arrangement a really beautiful Christmas feel. 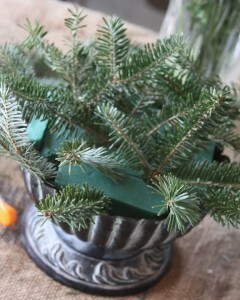 If you don’t have greenery left from your Christmas tree you can usually buy greens at the grocery store too. I basically cut pieces of the greenery and pulled the needles of at the bases so that I could easily push it into the foam. I like to make a nice full circle around he base and then add greenery to the center. Make them the height and width that you want the arrangement to end up being. 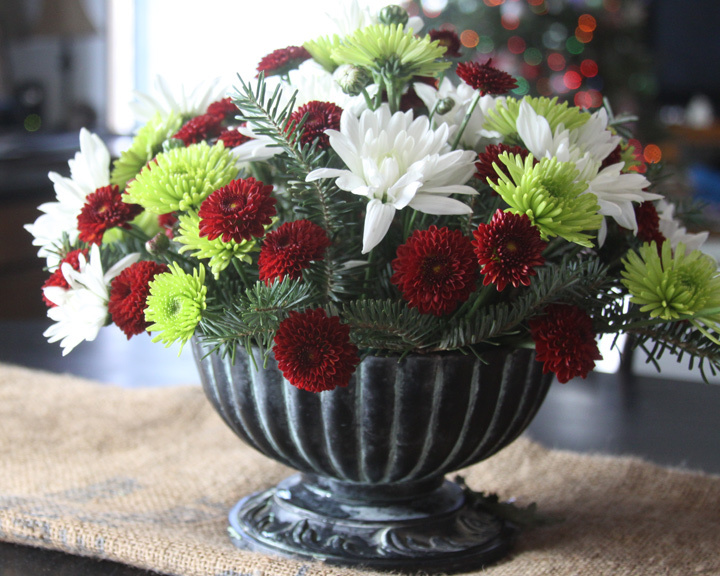 I wanted this arrangement to be nice and rounded out so that is how I placed my greens around the bowl. You don’t need to completely cover the foam because you still need room for the flowers. I then begin adding the flowers one color at a time. When you arrange with floral foam you can really control the shape your finished arrangement will have easily. I usually cut each flower off of it’s stem and lay them all out so I can see what I have. Just like the last arrangement, I started at the center and sides and then fill in flowers in between. You can always remove and move things as you go. This arrangement, because it is a centerpiece, is important that it looks nice from all sides. I try to mimic what I did on one side onto the other as I go. 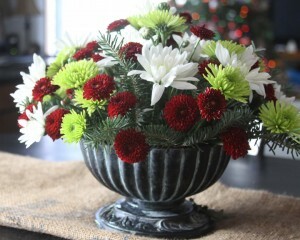 When you are all done you should have a beautiful holiday centerpiece that will last through Christmas. You will be so proud to tell people that you made it yourself when they ask you where you got it! To buy this centerpiece in our area at a floral shop would run you at least $50, but do it yourself and you can make it for about $8.00!! At that price you can make one for yourself and take one to the hostesses of all of your holiday parties. Make sure you water it daily so it lasts as long as possible. If you are making it ahead to give to someone else I suggest you stick it in the refrigerator until it is time to give it so that it fresh as can be. I also had one stem left of each color when I was done with the centerpiece, and decided to make another little vase of flowers to put by the sink for myself to enjoy while I do all of those holiday dishes! I just added a piece of pine, some cranberries, and my cut flowers for the perfect little vase filled with Christmas cheer. I hope you give arranging flowers a try. 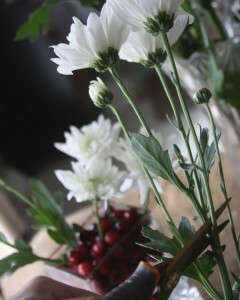 I really enjoy the process of making arrangements, especially to give to others for special occasions. It really is an inexpensive way to spread Christmas cheer!